Computational fluid dynamics (CFD) is the use of applied mathematics, physics and computational software to visualize how a gas or liquid flows — as well as how the gas or liquid affects objects as it flows past. Computational fluid dynamics is based on the Navier-Stokes equations. These equations describe how the velocity, pressure, temperature, and density of a moving fluid are related. Computers are used to perform the calculations required to simulate the interaction of liquids and gases with surfaces defined by boundary conditions. With high-speed supercomputers, better solutions can be achieved. 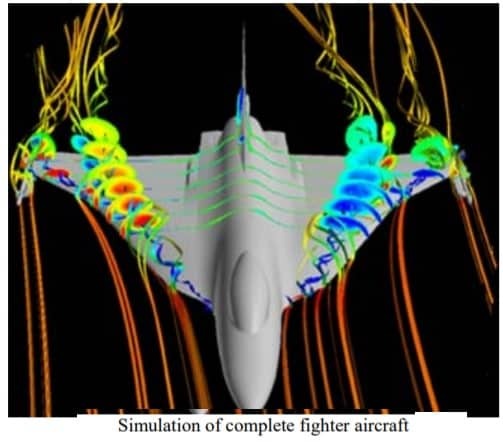 Ongoing research yields software that improves the accuracy and speed of complex simulation scenarios such as transonic or turbulent flows. Initial experimental validation of such software is performed using a wind tunnel with the final validation coming in full-scale testing, e.g. flight tests. The fundamental basis of almost all CFD problems is the Navier–Stokes equations, which define many single-phase (gas or liquid, but not both) fluid flows. These equations can be simplified by removing terms describing viscous actions to yield the Euler equations. Further simplification, by removing terms describing vorticity yields the full potential equations. Finally, for small perturbations in subsonic and supersonic flows (not transonic or hypersonic) these equations can be linearized to yield the linearized potential equations. CFD deals with approximate numerical solution of governing equations based on the fundamental conservation laws of physics, namely mass, momentum and energy conservation. Conversion of the governing equations for a continuum medium into a set of discrete algebraic equations using a process called discretization. Solution of the discrete equations can using a high speed digital computer to obtain the numerical solution to desired level of accuracy. Turbomachines: design of hydraulic, steam, gas, and wind turbines; design of pumps, compressors, blower, fans, diffusers, nozzles. Energy systems: analysis of thermal and nuclear power plants, modelling of accident situations for nuclear reactors. Hydraulics and hydrology: flow in rivers, channels, ground aquifers, sediment transport. Biomedical: simulation of blood flow through arteries and veins, fluid flow in renal and ocular systems. Fundamental flow physics: dynamics of laminar, transitional and turbulent flows. What Is IGES ,STEP Files -What it is Used For ? Skills required to become a successful mechanical design engineer. nice article on CFD !